Who said work vans have to be messy? The amount of things we accumulate to do our jobs effectively can soon get out of hand and before you know it the back of the van can end up looking like a scene from a horror movie. Well with van racking from MonsterShop it doesn’t have to be that way. 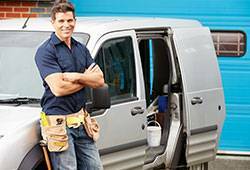 A tidy and organised work van not only makes life a lot less stressful, it can also increase productivity. Rooting around for 10 minutes looking for a specific part or tool could be the difference between getting off home on time and getting stuck in traffic, so why chance it. Get yourself set up with some van racking from MonsterShop so you can be home in time for tea and you could also be the envy of all your mates, bonus. Whether you need to organise your tools, fixtures, fittings, parts or any other equipment, then van racking is definitely the way to go. Plus with MonsterShop you’ll receive our FREE super fast next day UK mainland delivery (orders received before 2pm). So what are you waiting for?